Dry January – Should you give your liver (etc) a break? Should I have a Dry January? or 4 drinks (for men) on any single occasion. Plan to drink in a safe environment. Drinking more alcohol increases such dangers as alcoholism, high blood pressure, obesity, stroke, breast cancer, suicide and accidents. Also, it’s not possible to predict in which people alcoholism will become a problem. Drinking too much alcohol can raise the levels of some fats in the blood (triglycerides). Excessive drinking and binge drinking can lead to stroke. Other serious problems include fetal alcohol syndrome, cardiomyopathy, cardiac arrhythmia and sudden cardiac death. People who drink excessive amounts of alcohol — more than seven drinks per week for women or people older than 65 and more than 14 drinks per week for men younger than 65 — are at higher risk of death and many medical conditions. Excessive alcohol use is the third-leading cause of preventable death in the United States, according to the U.S. National Institute on Alcohol Abuse and Alcoholism. People who drink unhealthy amounts of alcohol are more likely to have high blood pressure, heart disease, liver disease, nerve damage, infections including pneumonia and even certain cancers like breast cancer. Drinking excessive amounts of alcohol is also associated with a number of psychiatric conditions, including depression, higher rates of suicide, anxiety, post-traumatic stress disorder, eating disorders, insomnia and other substance abuse disorders. The National Institute on Alcohol Abuse and Alcoholism defines binge drinking as a pattern of drinking that brings a person’s blood alcohol concentration (BAC) to 0.08 grams percent or above. 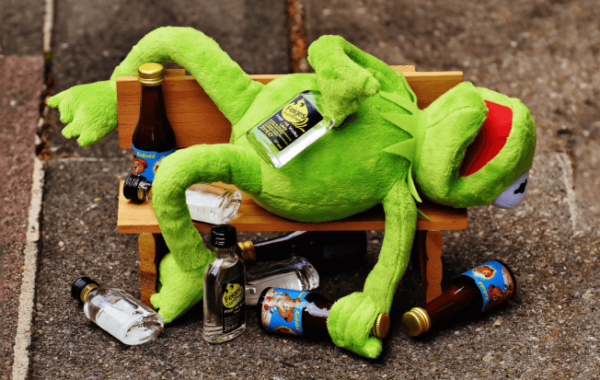 This typically happens when men consume 5 or more drinks or women consume 4 or more drinks in about 2 hours.4 Most people who binge drink are not alcohol dependent. Havcing said all that, most alcoholic liver disease develops in peopl ewho drink daily as opposed to binging one of 2 nights a week. Health benefits of drinking alcohol? If you don’t drink now, don’t start drinking to lower your risk of these health problems. There are many other ways you can lower your risk, such as eating a healthy diet, exercising, staying at a healthy weight, and not smoking. Talk to your doctor about your health and the benefits and risks of drinking alcohol. What about red wine and heart disease? Over the past several decades, many studies have been published in science journals about how drinking alcohol may be associated with reduced mortality due to heart disease in some populations. Some researchers have suggested that the benefit may be due to wine, especially red wine. Others are examining the potential benefits of components in red wine such as flavonoids and other antioxidants in reducing heart disease risk. Some of these components may be found in other foods such as grapes or red grape juice. The linkage reported in many of these studies may be due to other lifestyle factors rather than alcohol. Such factors may include increased physical activity, and a diet high in fruits and vegetables and lower in saturated fats No direct comparison trials have been done to determine the specific effect of wine or other alcohol on the risk of developing heart disease or stroke. Are there potential benefits of drinking wine or other alcoholic beverages? Research is being done to find out what the apparent benefits of drinking wine or alcohol in some populations may be due to, including the role of antioxidants, an increase in HDL (“good”) cholesterol or anti-clotting properties. Clinical trials of other antioxidants such as vitamin E have not shown any cardio-protective effect. Also, even if they were protective, antioxidants can be obtained from many fruits and vegetables, including red grape juice. The best-known effect of alcohol is a small increase in HDL cholesterol. However, regular physical activity is another effective way to raise HDL cholesterol, and niacin can be prescribed to raise it to a greater degree. Alcohol or some substances such as resveratrol found in alcoholic beverages may prevent platelets in the blood from sticking together. That may reduce clot formation and reduce the risk of heart attack or stroke. (Aspirin may help reduce blood clotting in a similar way.) How alcohol or wine affects cardiovascular risk merits further research, but right now the American Heart Association does not recommend drinking wine or any other form of alcohol to gain these potential benefits. The AHA does recommend that to reduce your risk you should talk to your doctor about lowering your cholesterol and lowering high blood pressure, controlling your weight, getting enough physical activity and following a healthy diet. There is no scientific proof that drinking wine or any other alcoholic beverage can replace these conventional measures. Drinking a glass of wine is good for the heart in the sense that the main mechanism by which alcohol protects the heart is increasing good cholesterol. The grape skin provides flavonoids and other antioxidant substances that protect the heart and vessels from the damaging effects of free oxygen radicals produced by our body. This is particularly true for diabetics because they have been shown to have a high production of free oxygen radicals. But we don’t have any evidence specifically related to diabetes patients. A glass of wine can also help individuals relax. The strongest evidence is in favor of wine, but some evidence recently showed beer and other types of alcohol may provide the same benefits related to increasing good cholesterol (HDL). In general, alcohol does not seem to have an adverse effect, unless an excessive amount is used — and it increases calories, among other things. For example, excessive amounts of alcoholic consumption could be harmful by increasing the risk of high blood pressure, for which diabetic patients are already at high risk. What problems does alcohol bring to the ER? Violence, motor vehicle accidents, other injuries, heart problems, liver disease including liver failure requiring transplant. Item responses on the CAGE are scored 0 or 1, with a higher score an indication of alcohol problems. A total score of 2 or greater is considered clinically significant. The campaign, as a formal entity, appears to be relatively recent, being described as having “sprung up in recent years” even in 2014. However, the Finnish government had launched a campaign called “Sober January” in 1942 as part of its war effort. The term “Dry January” was registered as a trademark by the charity Alcohol Concern in mid-2014; the first ever Dry January campaign by Alcohol Concern occurred in January 2013. In the leadup to the January 2015 campaign, for the first time Alcohol Concern partnered with Public Health England. In January 2014 according to Alcohol Concern, which initiated the campaign,[when?] over 17,000 Britons stopped drinking for that month. While there is controversy as to the efficacy and benefits of the practice, a 2014 survey by the University of Sussex found that six months following January 2014, out of 900 surveyed participants in the custom, 72% had “kept harmful drinking episodes down” and 4% were still not drinking. Thirty-one days of sobriety might even help you cut back long-term: A 2016 study published in Health Psychology found that six months after the end of Dry January, people who had participated in the movement (even those who didn’t abstain for the entire month) reported having fewer drinks per day, drinking fewer days a week, and getting drunk less often. The University of Sussex reported that 2015 Dry January participants in the United Kingdom also had several other benefits: 82 percent felt a sense of achievement, 79 percent saved money, 62 percent had better sleep, 62 percent had more energy and 49 percent lost weight. Staying dry for January may also help jump-start people to give up alcohol for longer. Although most people who participate in Dry January return to drinking, up to 8 percent stay dry six months later, according to Public Health England and the British Medical Journal. And those who go back to drinking drink less. A 2015 study conducted in the United Kingdom and published in the journal Health Psychology found that people who participated in Dry January drank less often, had fewer drinks when they did drink and were drunk less often six months after Dry January was completed. Dry January participants were also better able to refuse alcoholic drinks. These benefits were even seen in people who did not complete the whole month of Dry January. There is no harm in doing it (if you are dependent on alcohol then you should not stop all of a sudden; best to do it under guidance from a physician). If you think you may have a problem, or it’s effecting your life in a negative way, then go for it. It may help you. do not start to drink or increase your drinking for health benefits.